Today I met with Zamila Bunglawala, Deputy Director – Strategy and Insight, Race Disparity Unit at the Cabinet Office (in the red jacket above), who presented “the world’s first comprehensive ethnicity facts and figures dataset” at the Education and Employers and The Edge Foundation International Conference, London. She’s a Senior Civil Servant with a background in policy for the British Government, the United Nations and leading think tanks. Her current team, the Race Disparity Audit, based in Cabinet Office, is wonderfully unique in many ways. Not the least of these is the fact that the Prime Minister commissioned the team to develop the world’s first government website highlighting disparities across ethnic groups. It is also unprecedented in transparency, scope and scale but also because, as a team of data, digital and policy experts, are mostly women. 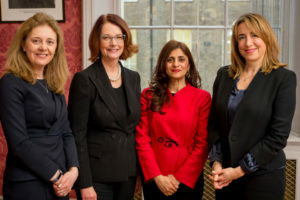 She’s inspirational, for example, she highlights the importance of intersectionality (the principle that people are made up of multiple identities and characteristics that intersect with each other) and the reality that women from minority groups can face additional challenges in access, progression and being recognised in leadership roles. Use this service to find information about the different experiences of people from a variety of ethnic backgrounds. It gathers data collected by government in one place, making it available to the public, specialists and charities. It’s a terrific resource!